The concept of Cardinal Planes divides the human body into equal halves in three directions and is used to define how the body moves through space. 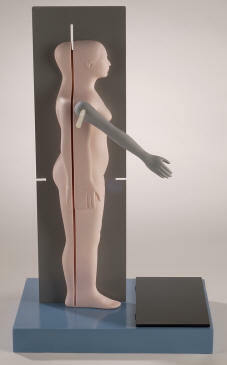 It also provides the basis for movement terminology such as "flexion and extension" at the body joints. Developed by a college professor, Plane Jane has been used to teach the concept of Cardinal Planes to college level students for more than fifteen. Student have found it to be extremely helpful to the learning process and lots of fun as well. 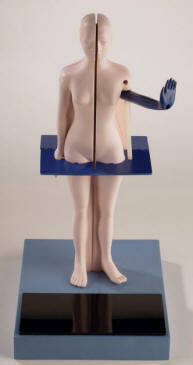 Plane Jane is fully three-dimensional one-quarter size human figure standing in the "Anatomical Position" exhibiting the three Cardinal Planes. Each plane is color-coded and detachable and can be demonstrated independently or in any combination with other planes. Jane comes with a set of three interchangeable arms, each color coded to match one of the planes and drilled to accommodate a plastic rod which represents the axis of rotation. With the axis rod inserted through the arm and into the model, the arm will move parallel to its plane, defining movements within that plane. 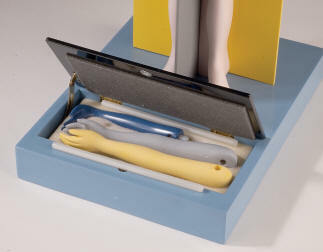 A handy foam-lined storage compartment built into Jane's base conveniently stows arms and axis rods.